The best tool in Iolo's System Mechanic 5 Professional remains it powerful Registry cleaner. Iolo technologies' System Mechanic has been my go-to suite for cleaning and optimizing my PC for years. The latest version, the $70 System Mechanic 5 Professional, has plenty of extras, but I'm not as enthusiastic about it as I was about earlier iterations. And be forewarned: Follow setup instructions to the letter, or you run the risk of serious system problems. I ignored the warning to uninstall older versions and found myself with an unbootable computer. My bad. So the second time around, I followed instructions more precisely and had no such problems. The interface is far more intuitive than previous versions, with the various tools grouped logically in five categories (Clean, Fix, Maintain, Optimize, and Protect). The suite's strongest features remain its registry repair and junk-file removal tools. Just be sure to back up your PC before using these or any other utilities in the suite. In addition, the suite has powerful file-removal tools that, unlike the Windows Recycle Bin, delete files permanently. And it retains (and improves upon) an outstanding set of tools for tweaking Windows settings. New to the product is the Software Uninstaller Tool, which lets you remove any program--even if it doesn't have an included uninstaller. Also handy is the new Software Relocator Tool, which moves applications to new locations while automatically updating all configuration data, links, and shortcuts. This tool can take some time to do its work, but it performs well. One feature that I won't be using is the software's disk-defragmentation tool. Incredibly slow and system-resource-intensive, it failed to finish the job on my test PC, exhausting the Windows paging file before it could complete the job. I won't be using all of System Mechanic 5 Professional's new tools. I can, however, recommend the reasonably priced suite as a good way to keep your computer clean and optimized. 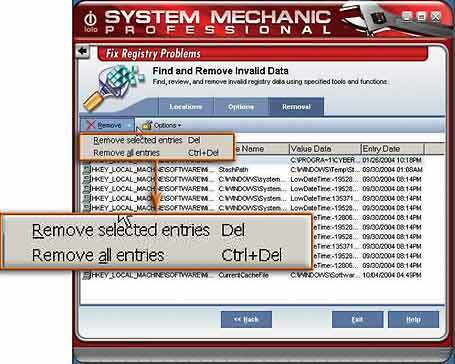 Suite of tools remains a great way to clean and optimize a PC, but follow instructions carefully.